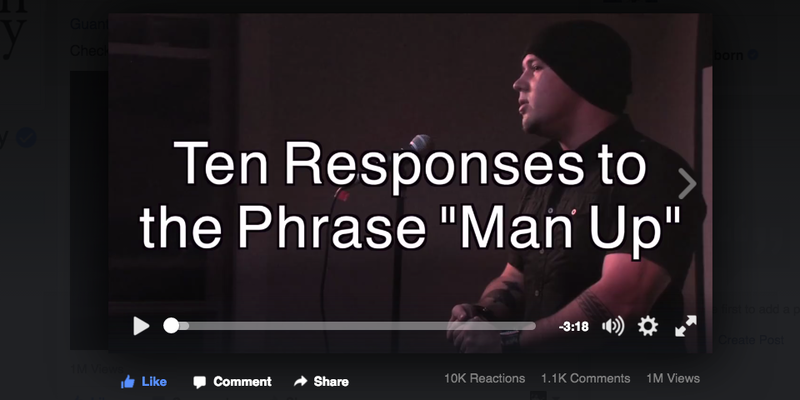 On Friday, Button Poetry posted their footage of my poem "Ten Responses to the Phrase 'Man Up' on Facebook video, and it reached a million views in just two days (the original version on YouTube is almost up to a million as well, but was posted three years ago; there's also this version, with the full text as well, on my own page, which I think is the highest quality audio/video). 1. The poem is in my book. If you like it, you will very likely enjoy the whole book, which is full of poems, song lyrics, and essays about these issues and many others. The blurb is below, and here's a link to how you can order one (through Button Poetry). 2. Bring me to your school or conference. My work actually involves traveling to colleges, universities, conferences, and other places to use spoken word as an entry point into deeper conversations about identity, power, and resistance. Check out my booking info here and get in touch. 3. On a craft/writing level, I've always thought of this one as an okay poem with a really strong "hook," which is the term I use to refer to its conceptual framework, the thing that makes it different from all of the other poems about masculinity/gender stuff out there. If you're an aspiring spoken word artist (or really any kind of writer), I think hooks are really important to understand, whether you choose to lean on them or not. I talk more about them through this video series. The poem is about how so many of the assumptions associated with masculinity are based in fear, shame, and insecurity; it's also about how so many assumptions about competence and power are based in masculinity. And yes, this is reflected in so-called "little things" like language and everyday pop culture that we don't often think critically about (not sure if people even remember the specific Miller Lite commercials that this poem is directly responding to). The poem is very much about the relationship between those "little things" and the larger realities of sexism and gender-based violence. The issue is not that telling people to "take responsibility and be strong" (which, yeah, I know is what "man up" means) is always a bad thing (though it can be, depending on what that person actually needs); the issue is that framing responsibility and strength as solely masculine qualities reinforces a whole lot of poisonous essentialist garbage about gender that ends up hurting people. Because this always comes up in conversations about language: remember that "hey let's maybe think more critically about the language we use" is not the same as "hey you should go to jail for saying the 'wrong' thing." Empathy is not censorship. The poem is about language, but it's also about something deeper than that. The poem is not saying that men have it worse than women (or gender-nonconforming people), or that we have it just as bad. Sexism hurts everyone, but it hurts everyone in very different ways, and a critical understanding of how sexism/patriarchy works is a necessary first step in disrupting and dismantling it. I know that sometimes MRA-type people kind of like the poem, which is weird. I mean, yeah, I can imagine how it might resonate with people who want to talk about the unfair and messed up expectations that society places on men. But this is still very much a feminist poem. Because it isn't women, or feminism, that places those expectations on men-- it's patriarchy. So people bring up men's high suicide rates, or how so many men "don't feel like they fit in" in our society any more-- I hear you. I just don't share your analysis. Feminism isn't the enemy-- it's an invaluable lens, a tool for actually fixing some of those problems (as opposed to just going on the internet and harassing women/complaining about feminism, which is the MRA approach). For more on this topic, check this out. Finally, just a note that if you like this poem, check this one out too. Plus, you can find all of my work here. PLUS, I made a list of 100+ spoken word poems by other people, including a dozen or so on gender and masculinity. This is an ongoing conversation, featuring many voices, and I'm thankful for the opportunity to be part of it. "As a man who advocates for feminism, an end to restrictive gender roles, and the elimination of toxic masculinity, I found this to be POWERFUL. More men need to speak up about the toxicity of modern notions of masculinity, which seek to box people in and prevent people from being who they are without stigma or discrimination. I'm a gay guy. So I'm very accustomed to hearing people associate masculinity with certain traits and being told that I'm not manly enough bc I don't fit into the narrow parameters our society has created to define "masculinity". I've adopted an intersectional approach to social justice advocacy and part of that is rejecting, wholeheartedly, the toxic notions of modern masculinity.